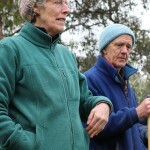 Christine and Team Henderson’s Taradale property was the ideal venue for this session, their 7.5 acre (3.2ha) bush block may be small, but it connects with the Fryers Ridge Nature Conservation Reserve and is surrounded by other, similar properties. 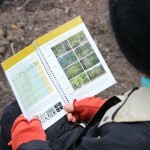 The size and siting enabled participants to think about both property and landscape level planning in relation to fire and biodiversity in a meaningful way. 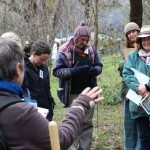 Chris Johnston facilitated the session, with presenters Owen Goodings (CFA – Statewide Team Leader Vegetation Management), David Cheal (Fire Ecologist – ex-DEPI and now School of Science, Information Technology & Engineering, Federation University), Julie Whitfield (Field Ecologist, ex-DEPI and now Amaryllis Environmental) and Christine and Team Henderson. 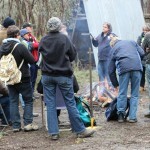 An introductory discussion from each of the presenters set the scene, including the cultural aspects of fire, our relationship with fire, the range of views and values about fire (including how fire is ‘packaged’ and discussed) the basics of fire behaviour and ecology, as well as the local context (ecological features, threatened species, etc). 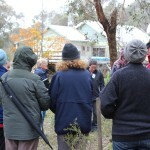 A walk to three sites on the property allowed the group to delve a bit deeper, see and experience. 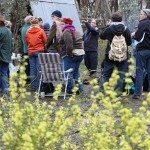 The concept of zoning is an important one when considering fire and biodiversity planning. The Hendersons have established three zones – furthest from the house area is the ‘bush zone’, closer to the house on the western side is the ‘interface zone’ – with modified biodiversity/ground layer, and the ‘domestic zone’ with house, garden and sheds. The presenters interpreted each site or zone through their particular ‘lens’ and discussed some of the issues and considerations. 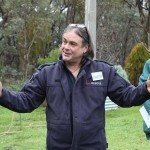 It’s very evident that no single ‘guideline’ or approach fits all properties, nor all landholders. Setting priorities (eg. what particular ‘biodiversity’ are you managing for – is it a particular orchid, or marsupial, or stand of old growth trees, or…? ), lots of observation, understanding the probabilities and assessing the risk of fire, will all help guide decision making. 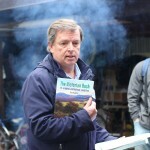 But the key message from the day is that it is possible to have biodiversity and to manage for fire risk. And that you need to make sure your insurance is up to date! 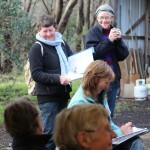 In the afternoon, participants carried out their own assessment on an area of Team and Christine’s property. 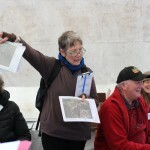 Small groups identified the level of fire risk, fuel levels and arrangement, biodiversity values, and decided on the actions they might take to manage the area, taking into account both fire threat and biodiversity. An engaged group, skilled facilitation, enthusiastic and passionate presenters, all keen to share their knowledge and expertise made for a great session. Thanks again to Christine and Team for opening up their property and their willingness to share their experiences. Hine, F., Tolhurst, K. Wilson, A. & McCarthy, G. 2010 Overall fuel hazard assessment guide, 4th edition. 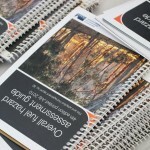 Fire and Adaptive Management Report No. 82. Department of Sustainability and Environment (appears to no longer be available on DEPI website). Ramsay, C. and Rudolph, L. 2003 Landscape and Building Design for Bushfire Areas, CSIRO Publishing. CFA, Building Commission Victoria, 2010. A guide to retrofit your home for better protection from a bushfire: building and renovation ideas to better prepare your home in a bushfire situation. Available from CFA web site – the page has some simple ideas and then downloadable documents at the end. Tolsma, A., Cheal, D. & Geoff Brown, 2007. 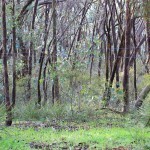 Ecological Burning in the Box-Ironbark Forests. Two volumes – Phase 1 – Literature Review, Phase 2 – Management Strategy. Report to the North Central CMA. Downloads available on the North Central CMA website. Adams, M and Attiwill, P. 2011 Burning Issues, Sustainability and Management of Australia’s Southern Forests, Bushfire CRC, CSIRO Publishing. 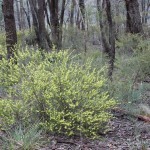 Hately, R, 2010 The Victorian bush: its ‘original and natural’ condition, Polybractea Press. 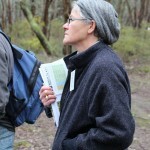 Castlemaine local, Joan Webster, has produced several outstanding books on bushfire safety. She also has an occasional email newsletter. 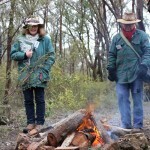 For more information & to order her books or request her newsletter: www.bushfiresafety.blogspot.com.au. Webster, Joan 2000. The Complete Bushfire Safety Book, Random House; Webster, Joan 2012. Essential Bushfire Safety Tips, CSIRO Publishing. Community Fireguard: Community Fireguard groups are based on a practical learning program offered at local neighborhood level. Contact the Community Education Coordinator at your Regional CFA headquarters, or text your name and location to 0429 423 692; a local coordinator will be in touch within a few days. 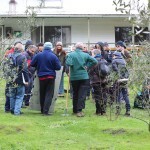 Sunday’s ‘Living with Fire and Wildlife’ workshop was another enjoyable, well-structured and well-resourced workshop by Connecting Country. Christine and Team Henderson’s picturesque bush property at Taradale was a great setting to highlight the features for this topic. 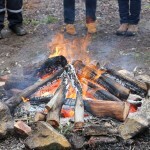 Despite the chilly day, on arrival we were warming our hands by an open fire and warming our insides with a hot cuppa. Our three passionate presenters Owen, David and Julie kept me engaged throughout. 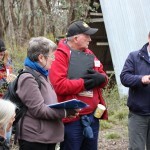 They each gave an initial overview on fire and biodiversity, and then built on those comments as we stopped at various locations on the property. 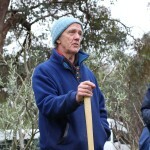 Owen spoke about the importance of zones on the property, the behaviour of fire, the flammability of plants, the role of different bark, and vegetation characteristics at each level of cover. 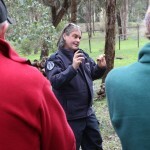 He also reassured us that there is a lot we can do to manage fire and have our biodiversity as well. 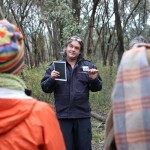 David explained landscapes and fire, and the importance of observation and prioritisation. He also stressed that there is no certainty on many levels, and that after fire there are always winners and losers with plants and animals. 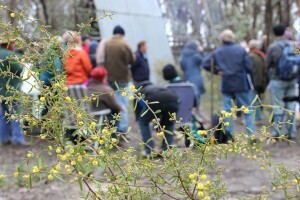 Julie spoke about our unique ecosystems, fragmented landscapes and our responsibility to look after the land. 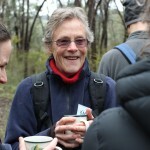 She also explained intricate relationships between species, and highlighted the serious impacts of removing just one element from the landscape. 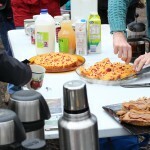 Other key points included the importance of connectivity to wider landscapes, and really knowing what is on the property. Walking to different locations on the property, which incorporated all of the three zones, gave me a much better understanding of zoning, and I started to see the landscape differently. 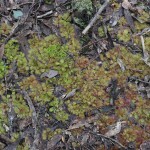 Each zone had different vegetation characteristics, and therefore each zone had different management requirements. I found it refreshing and affirming to have Owen, David and Julie explain (and sometimes debunk) many popular, yet equally confusing, theories regarding plants, animals, fire and fire practices. The final practical participation exercise tied together many learnings from the day. We broke into groups to discuss a scenario, and then came together to share opinions and strategies. This was followed up by final comments from Julie, Owen and David. I found today informative, engaging, thought-provoking, and reassuring. I walked away not just with practical information and resources to follow up on, but also a deeper sense of issues and viewpoints to consider and reflect on.